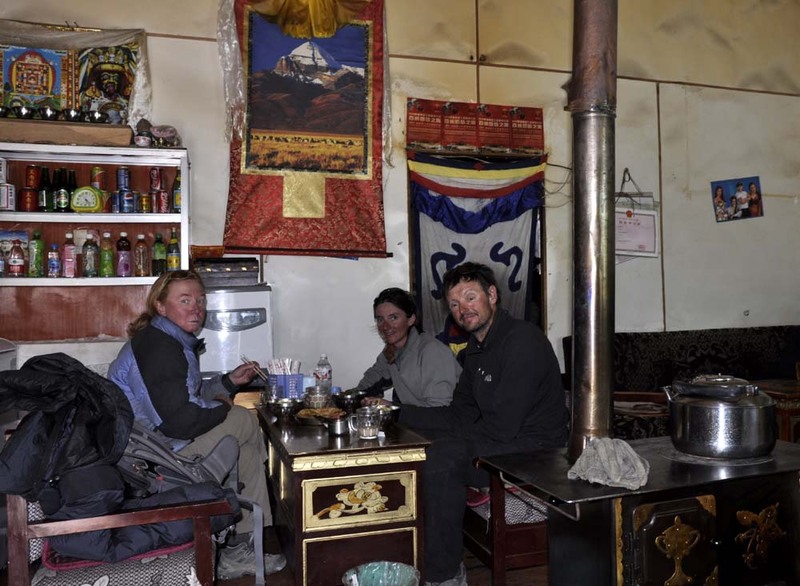 Three wheels across the Himalaya: In trouble ! A Chinese cyclist we met in Sumxi told us about a checkpoint just outside Ali. So we camped a few kms before the city and crossed it around 4am. We found the streets bustling despite the early hour (or late, it depends) : staggering drunken passers-by , flickering multicolour shop windows, taxis... Yet surprisingly, we spot no sign of a police car. The checkpoint is actually 2 kms past the center, and guarded by a policeman problably busy watching tv. The rope, which is supposed to serve as a gate, is lying on the ground. Riding on it is a piece of cake. There is not a single dog to bark at us. We pedal in the night, and most of all in the cold, wrapped up in our down jackets, with our feet and hands freezing. We take a breather after one hour. It's a smooth 20km ride up to the pass that we reach shortly after dawn. The light is superb, and the view on the snow-capped summits overlooking the Gar Tsampo valley (the Indus's main tributary) magnificent. Following that river some 100kms would lead us into India, and a bit further away into Pakistan. Time for the downhill now ! How good it feels to be riding on asphalt ! We take a short nap in the sun. Our feet slowly thaw. Then kms fly by. 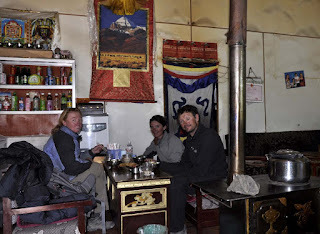 At this pace, we can hope to reach Mount Kailash in 3 or 4 days. The dream is about to become a reality and I already imagine myself in Lhasa or Kathmandu. We reach Ali around 5pm. The PSB offices are closed, we are taken down to a hotel. "You stay here, tomorrow you come to the PSB". Gee, a real room for each of us, with heat, a real bathroom, toilets and a shower (no hot water, there's reason in all things). All paid-for. We have a set appointment for the next day with the police who keeps our passport for now, just so as to avoid us disappearing. Meanwhile, we enjoy the comfort and pleasures of the city, and share a beer, drinking to our uncertain future.